Therefore it looks like this map is flawed. Anyways, the sparesity of the Germanic place names in Castile is just one more prove of that the Visigoths were not Germanic but of Iranian Osset origin. I guess that the widest indication of Germanic origin in the toponomy of the Iberian Peninsula is the -briga suffix, associated by many to the Germanic burgh. Those names have their origins in the expansion of the Celtic Culture in the peninsula in ancient times, but one must not forget that it was more of a cultural expansion than anything else. In areas with a well attested Iberian Mediterranean population, you can find those names too. As for example the old Segobriga (modern Segorbe) in the Levantine area of Valencia, which was inhabited by the Iberian Edetani at the time when such name was first attested in Roman texts. This, in my opinion, provides and evidence of a Celtic cultural expansion and some ethnical assimilation of Celtic people, as opposed to a Celtic ethnic expansion and systematic substitution of the indigenous Mediterranean inhabitants of the Peninsula. One of the little spring rivers of the Danube in the Black Forest has the name "Brigach" ("Brigach und Breg bringen die Donau zuweg."). "Brigach" means Bergbach ("mountain brook"), and the name is of Celtic origin. The Celts called the river Brigana. The Celtic word Brig means "mountain" or "hill", the suffix Ach is Germanic (Old High German aha: river or brook). 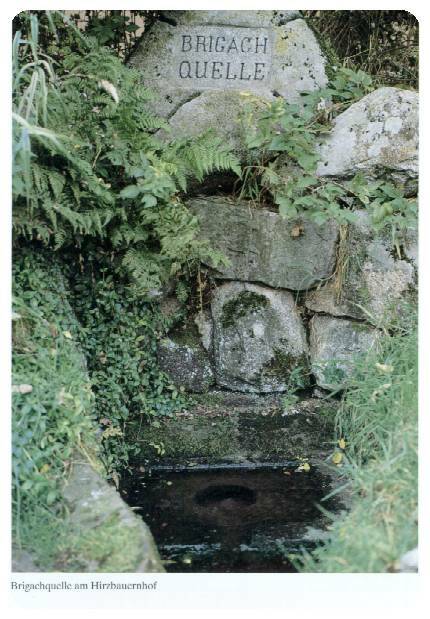 The Brigach spring is located on a sea-level of 932 metres directly under a farmhouse, the Hirzbauernhof. 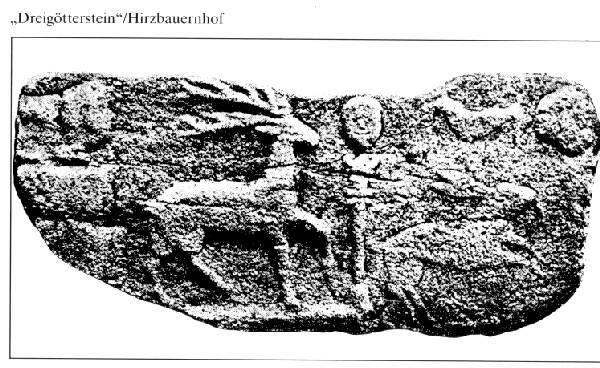 There was found in 1889 a stone relief in the vault of the baker's oven of the Hirzbauernhof, the Dreigötterstein (stone of the three deities): it shows a stag, a hare and a bird, surrounded by three heads which are interpreted as gods (probably with the goddess of hunting Diana on it). The three animals correspond with Celtic religious beliefs. The Dreigötterstein is generally seen as expression of Celto-Roman religious beliefs, as worship of the spring. Guardia Eslavona - that's Slavic Guard, and nothing so Slavo-centric about it! I think you should read the page for yourself. Is it Slavo-centric? Well, most of it deals with the Slavs of Muslim Spain (as the title goes) and with dispelling some mis-conceptions about them, so why should not the Slavs occupy the "center stage" in its contents? Perhaps most if if should have been about the Berbers of Muslim Spain, or what? The page uses a wide variety of sources, from several countries, written in three languages (four if you count Serbo-Croat as separate , and there are some who brake it down into even more languages ), and from wide ranging periods of time. And besides, claiming that the Goths originated from the Iranian Ossets is Slavo-centric? I think not! On top of that, I read pages about Normans, Mongols, and other "barbarians" and most of their contents were also very centered on their primary subjects. And does anybody complain about it? And with regard to the above map, were not its authors Germanic-centric when they mis-represented Celtic toponyms as "Germanic place names"? Nice map. I'd be interested in any more that you could provide, suggest, from the middle ages and prior. Admittedly, I know little about the Goths, but for some reason I always assumed they came from Scandinavia. Perhaps because of names like Gothenburg in Sweden (Goteburg). I assumed these places derived their name from Gothic tribes? If we could compare this map with maps shading the areas of Latin and Arabic toponimics, many of the areas which are dark shaded on that map would be seen equally dark shaded. Though perhaps some of the Arabic toponomics could be put into question, as in the cultural expansion of Islam the arabicisation of names (both for places and family names) was common. No digas gilipolleces, sabes muy bien que en Galicia no hay un puto topónimo árabe. Todavía espero verte para que me digas de que palo vas infiltrado de mierda. My granfather is from Toro (Castilla) a village founded by the visigoths at fisrt named VILLA GOTHORUM but through the years the name became Toro like a lot of places, those fields in the center of what is now Castilla were named Campos Góticos (gothic fields) now they are "tierra de campos" , the names change by the centuries. We also have a lot of roman, arabic, greek, celtic and iberic toponimes of course, but be sure that in Galicia there are very few or no arabic toponimes like in the north of castilla.